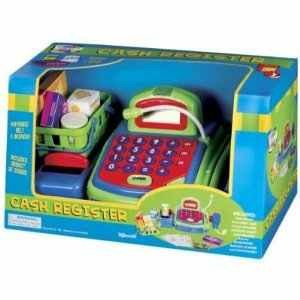 This play cash register features a working calculator and includes register, drawer key, scanner, moving belt, speaker, pretend currency & credit card, and shopping basket with five items. Cash register unit, including belt and scanner, measures 12 x 6.5 x 5 inches. Requires two AA batteries, included.